Falvey Memorial Library employs dedicated and hardworking students to provide assistance and direction to its patrons. Among these students are seniors Jeffrey Eisenberg and Clare Oven who assist the Access Services staff by helping patrons, by checking in/out books, videos and laptop computers and by assigning study rooms. Both students also shelve books: Clare on a regular basis and Jeffrey during high-volume times. Jeffrey Eisenberg is a New Jersey native majoring in communication with a business minor and an honors concentration. 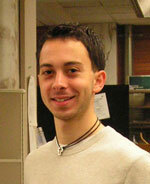 He has worked at Falvey since September 2006. Jeffrey says he enjoys being at a job where he can interact with students, faculty and staff rather than sitting in a quiet office on campus. He also appreciates the opportunity to study during quiet times. Jeffrey is president of Thundercats, a student-led organization that provides cheap-to-free activities for Villanova students on Friday and Saturday nights. He is also a tour guide with the Blue Key Society and a retreat leader for Campus Ministry. He was in two shows with the Villanova Student Theatre and went on a Habitat for Humanity service trip in 2008. Clare Oven is a mechanical engineering major from San Diego. 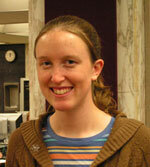 She has worked at Falvey since her freshman year, 2006. Clare has always had a passion for reading, and naturally wanted to work in the library. Clare says, “Working at Falvey has been a convenient campus job. It is an easy place to get to, and I have been able to set a good work schedule for myself.” She also adds that everyone who works in the library is very friendly, nice and helpful, which fosters a great working environment. Clare enjoys being able to help students get started navigating through all the different ways of information acquisition at Falvey. Her duties also include shelving books where she takes pleasure in spending time in a quiet atmosphere and seeing all the different types of books available. Overall, Clare has enjoyed her experience at Falvey and is truly going to miss working here when she graduates. Clare is a member of Villanovans for Life and serves on the Engineering Student Council. Reflecting Falvey’s mission of service to the University, this work experience equips students with practical knowledge in patron service and circulation duties, and the students who work at Falvey find this to be true.